Chocolate Pumpkin Tres Leches Cake, it's a delicious mouthful of ooey gooey goodness! My husband loves Tres Leches Cake, so with Fall quickly approaching I decided to combine his love of Tres Leches Cake and my love of all things pumpkin to create some sort of mouth-watering dessert. Mission accomplished! 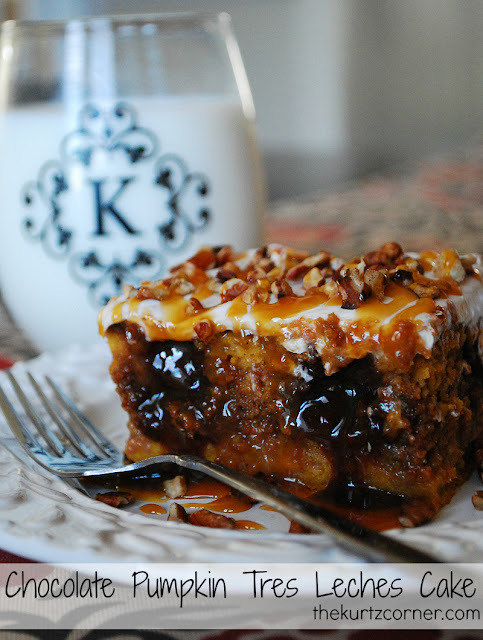 This recipe was a piece of cake (pun intended, hehe) and ooohhh sooo yummy! I don't think my husband will ever see Tres Leches cake the same, he literally screamed, "That was amazing! ", after taking his last bite! Preheat oven to 350 degrees F and grease a 13x9 inch pan. In a large bowl, beat cake mix with pumpkin, water, eggs, oil, and spices with an electric mixer until well combined. Pour batter into the pan and bake for 28 to 30 minutes. Remove cake from oven when done and immediately poke about 24 holes into the cake with a wooden spatula or spoon, about one inch apart and one inch deep. Quickly fill each of the holes with sweetened condensed milk and drizzle the rest over the top of the cake. Let stand for about 5 minutes or until the condensed milk is almost fully absorbed into the cake. Once absorbed, place 1/2 of the Hershey's chocolate sauce in the microwave and heat for about 20 seconds or until smooth. Pour the chocolate sauce into the holes of the cake. Pour 1/2 of the Hershey's caramel sauce into the holes of the cake. Cover the cake and place in the fridge for about two hours or until fully chilled. Remove cake from the fridge and ice. Sprinkle with pecans and drizzle with remaining caramel before serving. Refrigerate leftovers...if there are any! This cake looks and sounds FANTASTIC ! Sounds super good! I love pumpkin everything in the fall. Wow! It in indeed a very mouthwatering treat. Love it! Oh my! What's not to like about this? And just in time for fall! This looks so simple and so seasonal. Please share your cake today on foodie friday. Fall Subway Art - Free Printable! Product Review + Smoked Gouda Mac & Cheese!